Darlings, you are fierce fashionistas; as such, you require an accessory that proffers the very same magnitude of ferocity as yourself – which is precisely what one (1) of you daring divas will be taking home courtesy of Shock Boutique. Café Fashionista has teamed up with Shock Boutique to bring one (1) ravishing reader a Panther Ring quite similar to Cartier’s Panthere De Cartier Ring featured here. ♥Leave a comment on this post stating what your favorite Shock Boutique item is between now and Friday, November 19, 2010 at Midnight PST. ♥Follow Café Fashionista on Twitter @cafefashionista (2 Entries). ♥Follow Shock Boutique on Twitter @ShockBoutique (2 Entries). ♥Tweet about this Giveaway between now and Friday, November 19, 2010 at Midnight PST (3 Entries). ♥Follow Café Fashionista via Blogger/Google Friend Connect/BlogLovin’ (3 Entries). ♥Become a fan of Shock Boutique on Facebook (3 Entries). ♥Sign up for the Shock Boutique Mailing List (3 Entries). NOTE: If you are already a follower, please say so in your comment. I will randomly pick one (1) name out of a hat (who knows, it could be yours! ), and announce the winner on Saturday, November 20, 2010. This Giveaway is open to U.S. and Canadian Residents! Winner can choose their desired ring size (6, 7, 8, or 9). Thanks to Shock Boutique for the picture. Fun! I love the Messenger Hobo Bag! I love the Bijouterie bracelets that Kim K is wearing on the home page. I hope you have a good weekend, E.
I'm already a follower of your cool blog.. and I'd love to win this amazing ring!.. I visited the webpage and I like everything.. the rachel zoe style section is divine, the hats and the shoes! I can't choose.. I loved the studded leather motorcycle boots and the velcro wedge booties and the studded combat black boots... aghh.. I want them all! I am a follower on TWitter and Google Reader. I love your blog. That ring is gorgeous. I love that they sell things by celebrity style! Love Nicole Ritchie's outfits. If I win, can they get a smaller ring size? I have tiny fingers! They have some liquid matte leggings that are simply gorgeous! I love the ring too! I've been wanting a panther ring for as long as I can remember. I want the panther ring. I want the panther ring! the items are all fabolous!! but i really like the rings!! My favorite Item at Shock Boutique Im going to have to say is the Military Jacket with Leather Pocket.... SO GORGEOUS! Sorry if this is a double post but when I posted it didnt say anything and now Im worried that it didnt go through. Better SAFE than SORRY right? I am a follower of you - OF COURSE! i already follow you through friend connect. and i follow Shock Boutique on facebook. i love the thumb and index ring on their site as well. 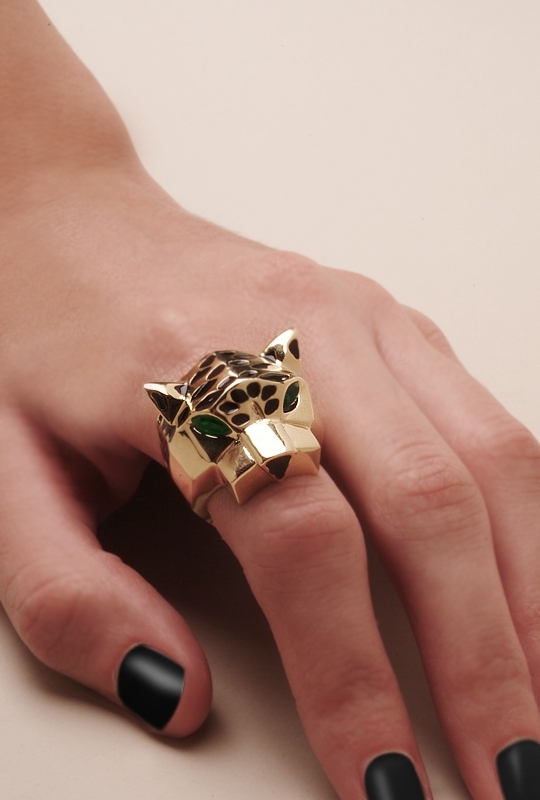 this panther ring is a great giveaway hun! So excited :) I love this ring. Besides the ring, I also adore the horn necklace and rose gold watch!! 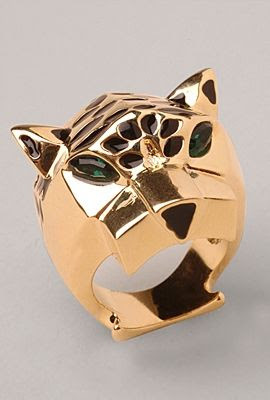 Don't be mad, but for some reason that cat ring reminds me of Transformers. Shock Boutique has some great stuff and I'm really loving this ring! I've also had my eye on the Addison Story Ash Double Breasted Blazer. So perfect! I had never heard of shock boutique before, but after reading this post I definitely will be visiting/ordering from this site often! I'm not a big fan of watches, but after seeing the white oversized watch with rubber band I have to say that is definitely something I would wear. Probably my favorite thing I've seen on the website so far. I love reading coming to your blog, you always have the most interesting pieces. Totally a devoted follower since January. too many wonderful things ! This ring is absolutely amazing!! I love it. It's to die for. Count me in! I like their oversized cardigan in grey. I follow you on twitter and Blogger. I love the gold boyfriend watch! & I follow you through google friend connect! I love this ring! Definitely my favorite item from Shock Boutique. I follow Cafe Fashionista on twitter. I really want a pair of skinny cargo pants, so these!! Great ring! And it looks fab with the matte black nail-polish on the pic too, I am really sad I can't enter..
following you and shockboutique on twitter & retweeted about this giveaway. My favorite item are the gold sequin pumps! ~I am a fan on facebook for Shock Boutique via Ashley N.
Thanks for the awesome contest! My favorite piece is the Owl Necklace with Feathers! +3 I'm an old follower! I LOVE the leopard print trench coat ala Rachel Zoe! So pretty! I follow you on twitter (and bloglovin and google connect) and now I follow shock on twitter and became a fan on facebook too! I also made shock a favorite of my facebook bostonista page! You have the best giveaways! The spiked ring is all kinds of fabulous too! I follow Shock Boutique on Twitter too! I'd love to win this panther ring. That way, I could justify buying my other fave on the Shock Boutique site, the Thumb & Index ring as seen on Christina Aguilera! Thanks for the opportunity to win! i'm a follower of @cafefashionista! i'm a follower of cafe fashionista on blogger/googlefriendconnect! Oh yes, I need this ring in my jewelry box. :) Fab giveaway! Follow you on GFC, too!